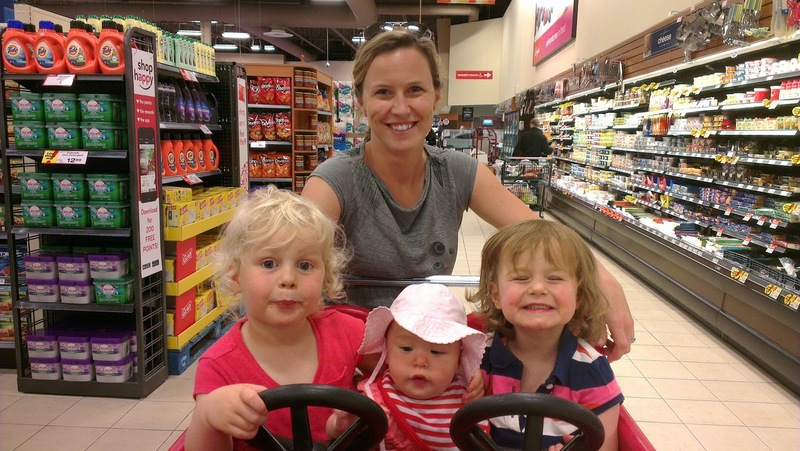 2moms2dogs2babies: Weekend Fun and World Pride! 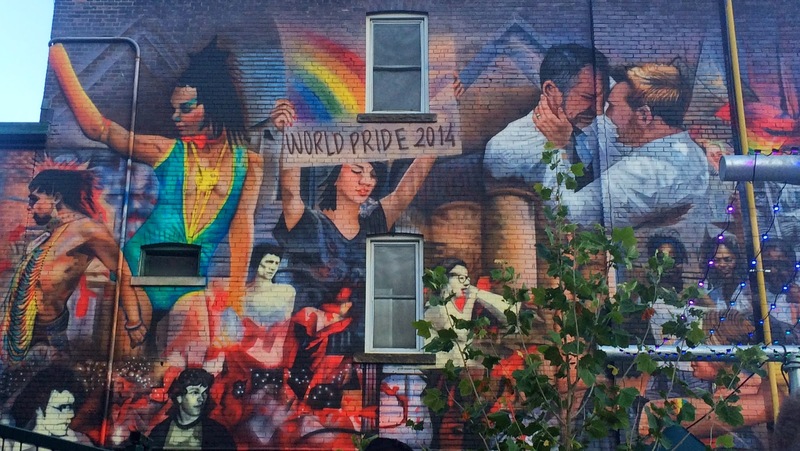 Weekend Fun and World Pride! We had a very busy extra long weekend in Toronto. Jenn and and I kicked off our Pride by attending a Pride At Work event on Thursday night. We then grabbed a quick bite to eat with our friends, Justine and Andrea and Jenn's coworker, Jade. Our passes to the work event got us into the beer garden for the drag show. After a challenging day with my little people, I was thrilled to get out for the night. 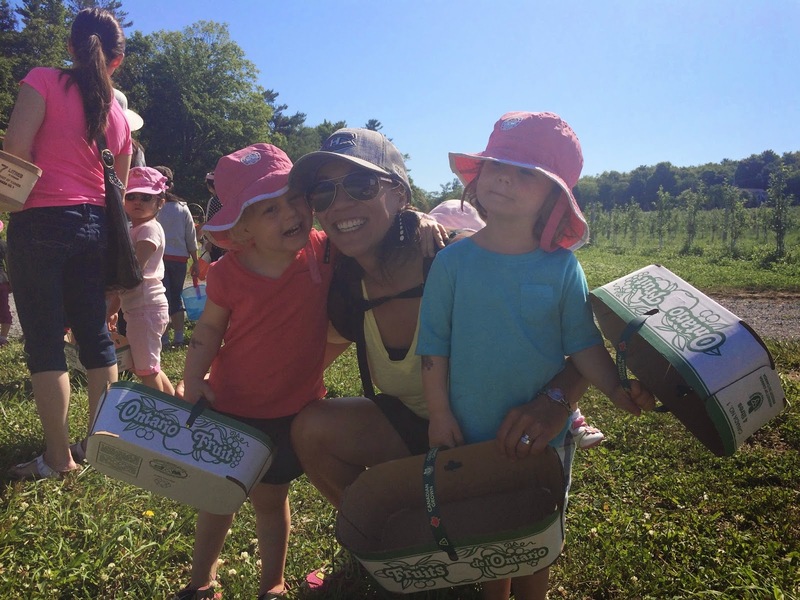 My friend, Cheryl and I took the girls to an organic strawberry farm on Friday. It was a very hot day so I wasn't sure how the girls were going to handle being out "in the fields" under the blazing sun. 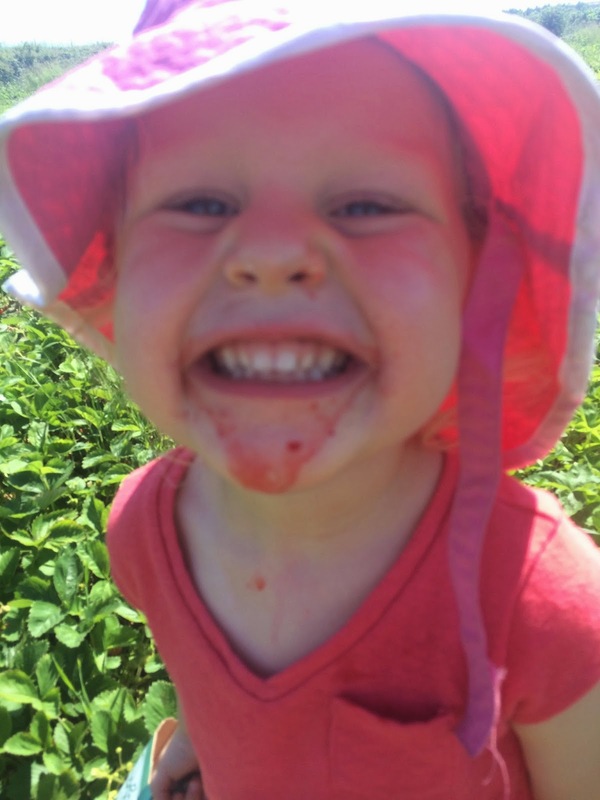 With what seemed like unlimited amounts of strawberries to eat pick, the girls did just fine. 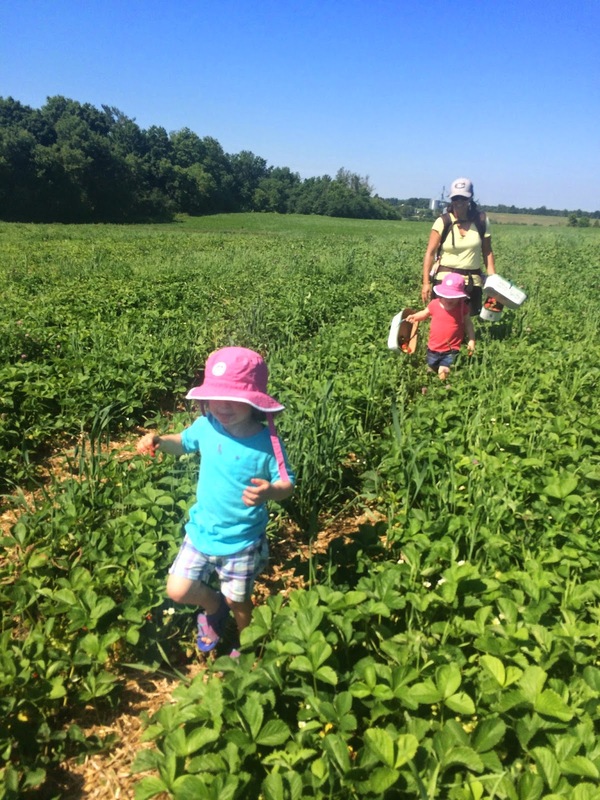 Quinn was on a mission after Cheryl showed her which strawberries were ready to be picked. Someone only loosely followed their "taste but don't eat" rule! After filling two baskets full of fresh strawberries, we got back in the car to head home. My goal was to put the girls down for a nap right when we got home. I had expected that the farm would have some healthy snacks for purchase, but they didn't have much. We ended up stopping at nearby grocery store to grab them a quick car-ready snack to supplement the pound of strawberries that they each ate. While Cheryl used the washroom, I plopped her baby in between the girls. I'm not going to lie. Seeing the girls put their arm around the little one and gently place her hand on the steering wheel, while giving her little kisses on the head, didn't help my baby fever. Our friends, Sarah and Delia, arrived on Friday afternoon to celebrate World Pride. After the girls woke from their nap, the five of us went down to Church St. to meet up with Jenn. Set up was still underway since they block off about 2km of streets for the weekend. Teagan was acting off. She said that she was hot and tired. I chalked it up to the fact that they haven't been sleeping well. For at least ten days now, one or both of them have been up in the night at least once. Needless to say, we are all tired and a bit cranky. I grabbed them some food and she barely ate. When we arrived home, we got them ready for bed quickly, but she was definitely not feeling well. I eventually took her temperature and it was about 38.5C (101F). She was having trouble settling. She eventually fell asleep, only to wake 10 minutes later. I finally gave her a sippy cup with ice water and a drop of juice. Within 5 minutes of drinking it and putting a cold cloth on her head, she was revived. She was chatting normally and laughing. 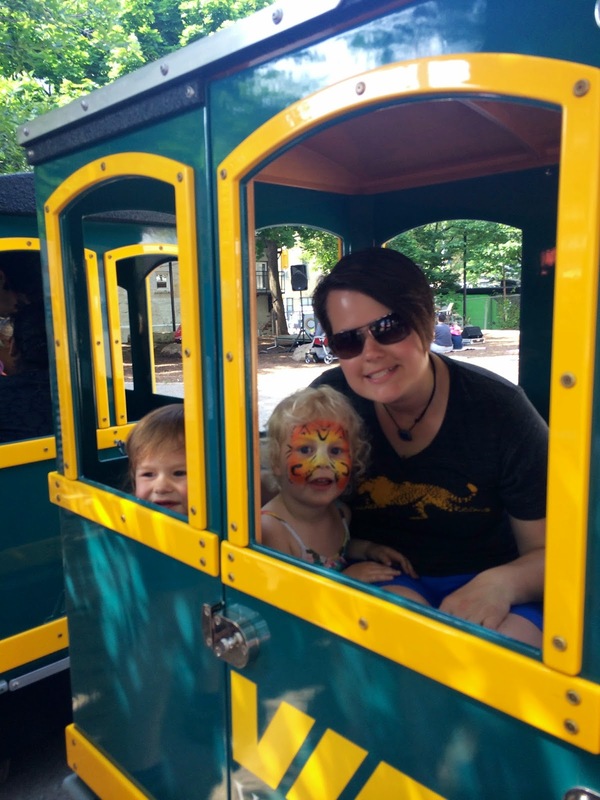 Mom of the year here…my kid was apparently dehydrated and maybe slightly heat stroked. I'm trying not to be too hard on myself since the behaviour matched that of an overtired Teagan. She ended up chatting and cuddling in bed with Jenn and I until 9:30pm. She, of course, loved it and didn't want to go back to bed. By the morning, she was acting normally and ready for the family Pride celebrations. We took the girls down Family Pride on Saturday morning. Despite an early start to the day, Teagan was quite happy and got her face painted again (another tiger!). 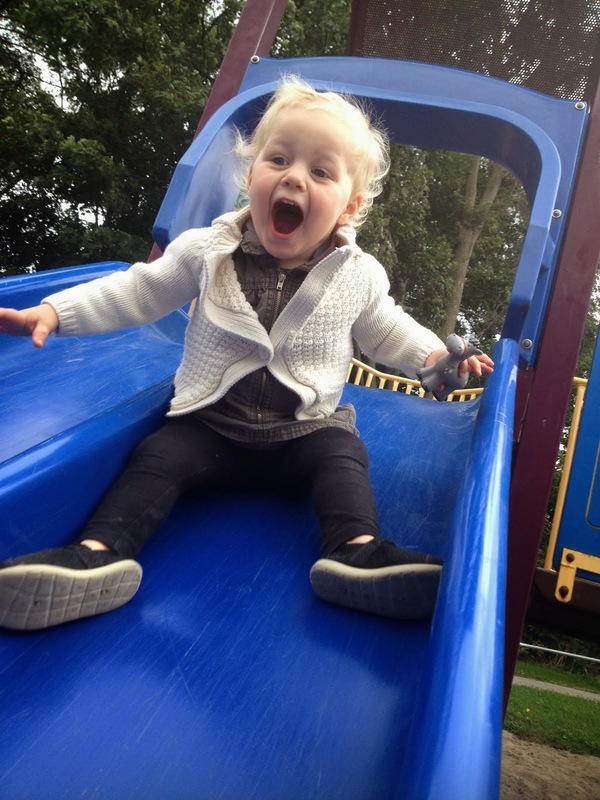 With bouncy castles, an obstacle course and a train, the girls were in heaven. A meltdown by Quinn prompted a quick exit unfortunately, but we all still enjoyed ourselves. My parents very kindly took the girls in for a sleepover on Saturday night. After dropping them off after lunch, Jenn, Sarah, Delia and I headed back down to the beer garden for some fun with friends. After some drinks and dinner, this sleep-deprived Mommy was spent. With the girls out of the house, a guaranteed full night's sleep was in store. I took full advantage and slept for 9 hours straight. Amazing! My parents were lucky enough to receive a 5:30am wake up call from their granddaughters. Teagan did a fantastic job of peeing on the potty at their place, but announced to my Dad several times that she was going to wait to poo until she was with Mommy. Lucky me. We then took the girls down to celebrate the last day of Pride at the 519 Community Centre's splash pad. Unfortunately, their early morning wake up resulted in mid-morning crankiness so we didn't last for long. All in all, a fun World Pride weekend! It looks like you guys had a great weekend! I can't wait to be closer to Jacksonville so we can take the boys to the pride festivities there without having to figure nap schedules into travel time & such. An Oversight from the "Weekend" Post!